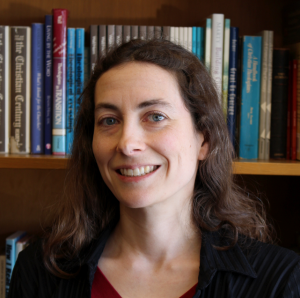 Elizabeth Palmer is the Books Editor at the Christian Century magazine and author of Faith in a Hidden God (Fortress). An ordained minister in the Evangelical Lutheran Church in America, she served as the Lutheran Campus Pastor at the University of Chicago for eight years and has also worked as a hospital chaplain. She is a 1997 graduate of St. Olaf College in Northfield, Minnesota, where she majored in chemistry, mathematics, and religion. She also holds a Ph.D. in theology from the University of Chicago Divinity School. Elizabeth lives with her family in Skokie, Illinois.